It’s amazing where time goes as you get older, I’m within a few days of turning thirty and can’t help but feel like I’m starting to really evolve in ways I’d never have imagined. All of a sudden the thoughts and opinions people have of me don’t feel such a pressing concern, I’m having to work a tad harder to shed the Christmas cheese board, and I’m starting to really feel like the latest pop bands are singing over me rather than towards me. In short I’m becoming the middle-aged man I’ve always dreaded, and the scary thing is I’m absolutely loving it. I’ve spent the best part of my life feeling like my interests haven’t changed one bit. During my late teens/early twenties I’d rattle down pasta as pure fuel, save all my cash for going to nightclubs as much as I could, laugh hysterically through the whole night with my friends and wake up the next day not remembering a thing. Life couldn’t get better than this, I had it all, and things would stay like this forever. Nowadays though food is a major hobby of mine, I can’t think of anything better than sitting with a nice bottle of wine and a good meal with a small group of close friends. The thought of queuing all night at a busy bar like a pack of pigeons hustling for breadcrumbs makes me wince. So what do I do for fun? Well I can’t eat ALL the time, those Christmas cheeseboards are hard work enough! I’ve actually rediscovered the Cinema as a perfect way to spend an evening, my girlfriend and I regularly have a lovely meal, visit the cinema and top it off with a cocktail. Sounds nice doesn’t it? Well the reality is despite the comfy chairs there’s a growing issue (which grows every year I get older), your typical multiplex cinema is designed for people who frighteningly could be my own kids already. From my time working on Warner Brothers I know that there’s only so many Dark Knights, and Harry Potters, the rest of the schedule is filled with safe film fodder. And how do you build film fodder? You know your audience, what’s worked before and you play it safe; build revenue gradually and take minimal risks. This is why Pretty woman led the way for hundreds of imitations, one guy, one girl and a white background, the perfect blend for a moderate box office win. There’s surely a bigger opportunity than what we have at the moment, and the numbers aren’t looking good for cinema as it stands. 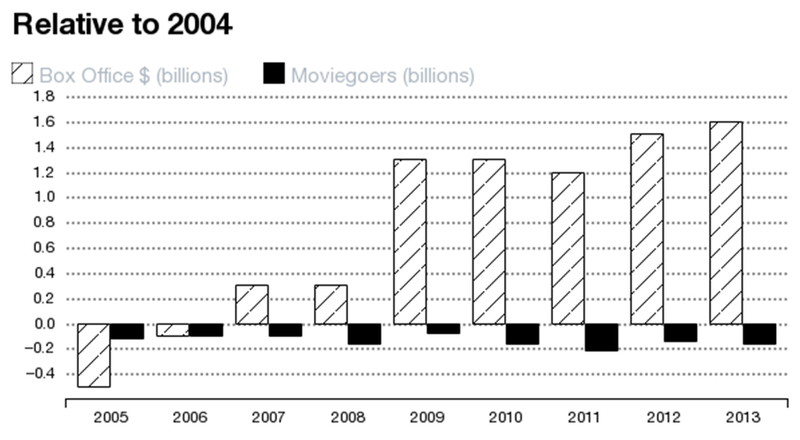 Revenue may be growing year on year but that’s largely due to hikes in ticket prices, (as 3D briefly became the savior of cinema) the number of cinema tickets sold is actually decreasing over time. As with anything played safe over and over again, the effect gradually declines. But what if the cinema industry had a whole refreshed audience? What if Art house filmmakers were given a bigger platform to entertain? What if Jennifer Anniston could remain in the 90’s where she belongs? I believe the time is now. As we can see from the global revenue reports, the industry sees a very healthy year on year growth of 3% – 6%. On the surface everything looks great for cinema, Avatar boomed and created another premium in 3D to add to the revenue stream. The revenue shows no signs of slowing down at the moment, great time to be in cinema it seems doesn’t it? Well actually when you scratch the surface there’s some big problems ahead, and I don’t think they’re too far away. Whilst box office revenue is increasing year on year, the ticket sales is actually on the decline, meaning only one thing. The revenue is increasingly being supplemented by a hike in ticket prices, the figures are masking an unhealthy industry. The problem is by increasing the cost to go to the cinema ticket sales are likely to continue decreasing, and the industry will eat itself. I can see a time where cinema multiplex revenue hits decline, more and more money conscious teens are pirating content and the rising costs of cinema viewing is only going to make piracy more compelling. Whilst having teenagers crunch popcorn in your ear is annoying it does supplement ticket sales revenue, but if fewer people visit that’s less popcorn crunchers. The movie studios need to stop focusing on preventing piracy (ask the music industry how that’s going…) and address the fact they’re all fighting over the same decline audience demographic! The 18-24 demo are only 10% of the population, and whilst they’re over indexing by 70% for tickets sold there’s surely a lot of scope to increase this net. The 25-39 demographic is 20% of the population yet they’re only over-indexing in tickets sold by 15%. This demo is begging to be serviced appropriately with relevant films and more importantly a relevant experience. Cinema needs people with high disposable income who don’t mind paying for content, and they need to distribute to places where these people want to be. Why can’t bars offer Theatrical content? So going back to my usual evening out, I start off in a nice restaurant with like-minded people, then step back into my teens at the cinema, picking the least ill-fitting film I can find. I wrap my night up with a nice cocktail bar where I’m back with my thirty year old peers. What I want to know is why can’t I have my cocktail with my film? If there’s one thing that Starbucks has taught us it’s the value of creating a destination, the longer you keep people comfortable the more they’ll spend. If I spent as much time in the cocktail bar as I did at the cinema I estimate my bill would hit $45 instead of the usual $15. You can double that too if you include my girlfriend. I can’t be alone in wondering if cinema needs to be liberated from the multiplex youth club so that we’re not all shoehorned into the same venue. We’re already seeing high calibre bars such as Sydney’s, ‘Beresford Hotel’ showing cult films on a Tuesday night, and art house cinema houses such as Darlinghurst’s Palace Cinema are also providing a good alternative and paving the way for change. In a time where internet speeds are growing so fast we don’t know what to use it for, it’s not impossible to see how this could work. Surely paid content can be policed through an on demand steaming service, and catered for the size resolution required? Then bars could pay a varied fee based on the screen size, and audience size to go with it. Bars could offer bar food, cocktails and end up making $60 -$80 per head, plus a potential entrance fee. This would be an amazing cinema experience and I’d pay good money to never have to share a cinema with thirteen year old kids again. Hello Martyn ! 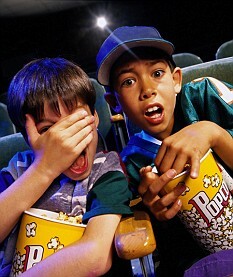 Sorry to tell you but you will have to support little brats if you want to keep seeing movies ! http://www.empireonline.com/interviews/interview.asp?IID=1714 Do you think that bars will be able to afford the technology ?